Today is Sonam Kapoor's wedding day with her long-time beau, Anand Ahuja - and the moment we've all been waiting for is here. 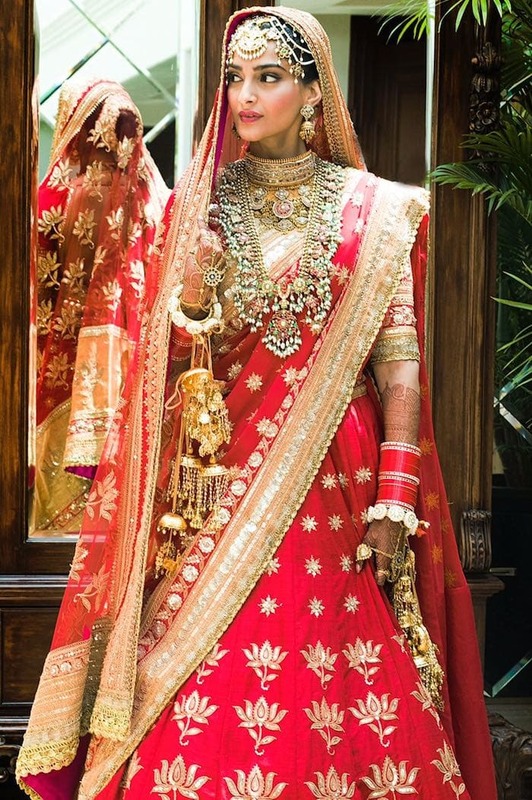 Pictures of Sonam Kapoor have been revealed and, as expected, Sonam makes a stunning bride. However, in a surprising twist, Sonam forwent her usual experimental route for her wedding day and went the absolute traditional way. 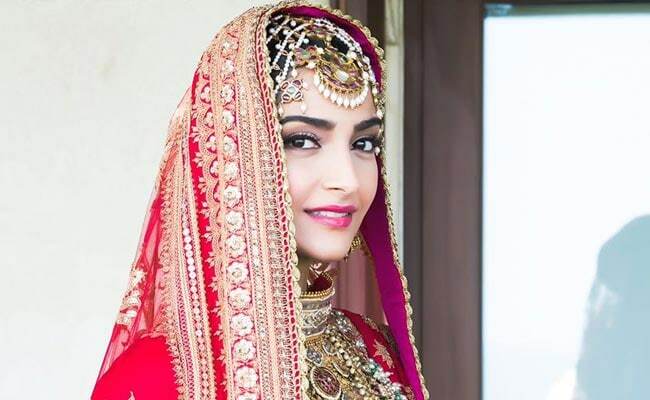 Sonam has chosen to wear a traditional red lehenga from designer Anuradha Vakil. Her outfit is accompanied by traditional jewellery - a sarpech on her head, a gold choker, a raani haar and haath phool. We also see her wearing a red choora. Have a look at the resplendent bride. Sonam's makeup has been done to perfection by her favourite and usual makeup artist, Namrata Soni. Namrata is known to have created some of Sonam's most iconic looks, and this is definitely one for the books. We love how she's kept Sonam's makeup minimal, with kohl rimmed eyes, pink lips and fresh dewy skin. It compliments her bright red lehenga flawlessly. Here's a look at Sonam's complete outfit. Prior to her wedding function, Sonam had a mehendi lagaai party, and a mehendi/sangeet party. 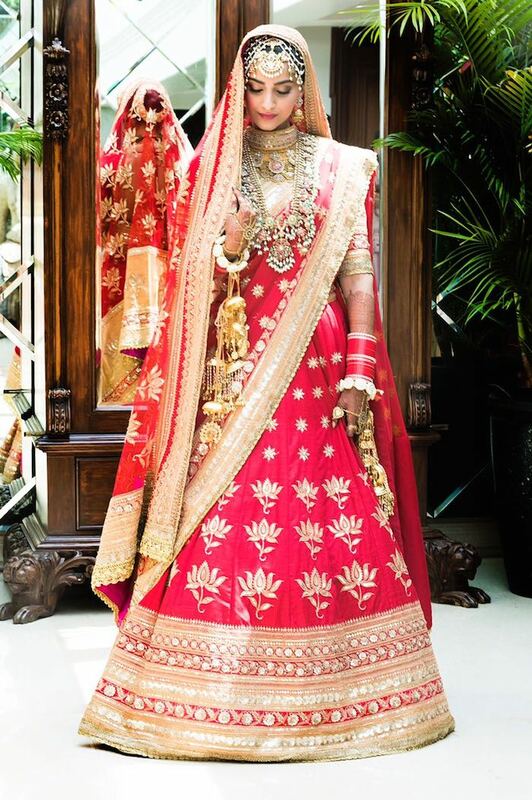 For the mehendi lagaai that was in her home, Sonam wore another Anuradha Vakil ensemble. It was a simple outfit that was a melange of pastel colours. Here's a picture of the happy bride getting her mehendi put. For the mehendi and sangeet function, Sonam wore an ivory and gold Abu Jani Sandeep Khosla lehenga. Sonam's entire look has been admired endlessly and we have a feeling that this one in particular is going to stick in public memory. Here's wishing the gorgeous bride Sonam and her groom Anand Ahuja, looking very dapper himself in a gold sherwani, a very happy married life.